Provider-hosted add-ins are one of the two major types of SharePoint Add-ins. For an overview of SharePoint Add-ins and the two different types, see SharePoint Add-ins. They include a web application, service, or database that is hosted externally from the SharePoint farm or SharePoint Online subscription. They may also include SharePoint components. You can host the external components on any web-hosting stack, including the LAMP (Linux, Apache, MySQL, and PHP) stack. There are many ways to set up a development environment for SharePoint Add-ins. This section explains the simplest way. For alternatives, such as setting up an "all on-premises" environment, see Tools. If you don't already have Visual Studio 2013 or later installed, install it by using the instructions at Install Visual Studio. We recommend using the latest version from the Microsoft Download Center. Visual Studio includes the Microsoft Office Developer Tools for Visual Studio. Sometimes a version of the tools is released between updates of Visual Studio. To be sure that you have the latest version of the tools, run the installer for Office Developer Tools for Visual Studio 2013, or the installer for Office Developer Tools for Visual Studio 2015. Reference earlier versions of Visual Studio or other Visual Studio documentation. Are you a Visual Studio (MSDN) subscriber? Visual Studio Ultimate and Visual Studio Premium with MSDN subscribers receive an Office 365 developer subscription as a benefit. Redeem your benefit today. Do you have one of the following Office 365 subscription plans? If so, see Create a developer site on an existing Office 365 subscription. Sign up for an Office 365 developer subscription through the Office 365 Developer Program. See the Office 365 Developer Program documentation for step-by-step instructions about how to join the Office 365 Developer Program and sign up and configure your subscription. Select the Build Add-ins link in the upper-left corner of the page to open your developer site. You should see a site that looks like the one in the following figure. 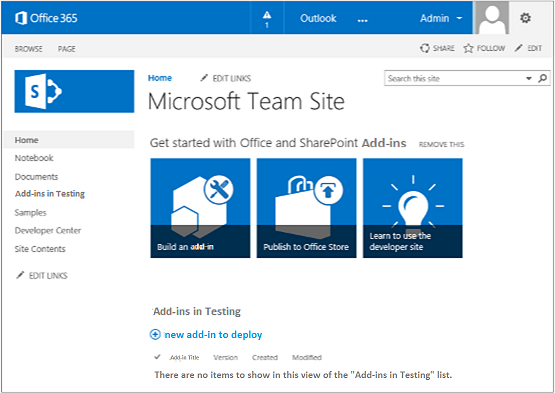 The Add-ins in Testing list on the page confirms that the website was made with the SharePoint Developer Site template. If you see a regular team site instead, wait a few minutes and then restart your site. Make a note of the site's URL; it's used when you create SharePoint Add-in projects in Visual Studio. Start Visual Studio by using the Run as administrator option. In Visual Studio, select File > New > New Project. In the New Project dialog box, expand the Visual C# node, expand the Office/SharePoint node, and then select Add-ins > SharePoint Add-in. Name the project SampleAddIn, and then select OK. Provide the full URL of the SharePoint site that you want to use to debug your add-in. This is the URL of the developer site. Use HTTPS, not HTTP in the URL. At some point during this procedure, or shortly after it completes, you will be prompted to sign in to this site. The timing of the prompt varies. Use the administrator credentials (in the *.onmicrosoft.com domain) that you created when you signed up for your developer site; for example MyName@contoso.onmicrosoft.com. Under How do you want to host your SharePoint Add-in, select Provider-hosted. On the Specify the target SharePoint version page, select SharePoint Online, and then select Next. Under Which type of web application project do you want to create?, select ASP.NET Web Forms Application, and then select Next. Under How do you want your add-in to authenticate?, select Use Windows Azure Access Control Service. In the wizard, select Finish. Much of the configuration is done when the solution opens. Two projects are created in the Visual Studio solution: one for the SharePoint Add-in and the other for the ASP.NET web application. Open the AppManifest.xml file. On the Permissions tab, specify the Site Collection scope and the Read permission level. Delete any markup inside the <body> tag of the Pages/Default.aspx file of your web application, and then add the following HTML and ASP.NET controls inside the <body>. This sample uses the UpdatePanel control to enable partial page rendering. <tr><th><asp:LinkButton ID="CSOM" runat="server" Text="Populate Data"
Add the following declarations to the Default.aspx.cs file of your web application. In the Default.aspx.cs file of your web application, add these variables inside the Page class. Add the RetrieveWithCSOM method inside the Page class. This method uses the SharePoint CSOM to retrieve information about your site and display it on the page. // Load the properties for the web object. // Get the site name. // Load the lists from the Web object. // Load the current users from the Web object. Add the CSOM_Click method inside the Page class. This method triggers the event that occurs when the user clicks the Populate Data link. Replace the existing Page_Load method with this one. The Page_Load method uses methods in the TokenHelper.cs file to retrieve the context from the Request object and get an access token from Microsoft Azure Access Control Service (ACS). // For simplicity, this sample assigns the access token to the button's CommandArgument property. // In a production add-in, this would not be secure. The access token should be cached on the server-side. The Default.aspx.cs file should look like this when you're finished. Use the F5 key to deploy and run your add-in. If you see a Security Alert window that asks you to trust the self-signed Localhost certificate, select Yes. Select Trust It on the consent page to grant permissions to the add-in. Visual Studio will install the web application to IIS Express and then install the add-in to your test SharePoint site and launch it. You'll see a page that has the table shown in the following screen shot. To see summary information about your SharePoint site, select Populate Data.